…the economy works in our favor. …so the economy works in our favor. Greatness is a mindset, a choice in our focus, and the ability to act upon that focus. Greatness is not something you go get – it’s something you deliver. We’re scheduling a spontaneous book release this month. 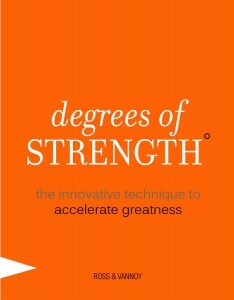 On Monday, January 23, Degrees of Strength: The Innovative Technique to Accelerate Greatness hits the shelves. Only our A-Team members have access to read a SPECIAL Behind-the-Scenes “Degrees of Strength: A Journey” by author, Craig Ross. Join the A-Team by Jan 11 to read this rich, personal account from Craig and learn about his life-changing introduction to Steve Vannoy. CLICK HERE for FREE ACCESS. (If you’re already on the A-Team, no need to sign up again, we’ll send it directly to your inbox). How will scheduling spontaneous greatness impact your work this week? Your comments are valuable to our entire community, share the below so other leaders can benefit from your good thoughts. Cherish and count every moment, the time to DO and to be GREAT is NOW, create the conditions for greatness and success by focusing on the most critical task at hand then tackle the next and so on. Tomorrow is promised to no one. Wise words, Ahmad. And the amazing thing is, when I use the approach you’re recommending, my “life satisfaction” goes way up, too. Thanks – and here comes a great ’12! Currently working in a facility that is being closed, it seems strange to frame goals around when all of the inventory is shipped out, all the assets redeployed or sold and the lights turned off. My team is the perfect example of “being great now” being actively engaged and hitting timelines even though success will mean the end of their careers with the company. They deliver greatness every day and because of that, I know that they will achieve success even after they move on to their next careers.